At the end of her important book about performance practice in the era of the Romantic ballet, “Ballet and Opera in the Age of Giselle” (2000), Marian Smith asks, “What would happen if an attempt were made to mount a ‘Giselle’ that conforms as nearly as possible to the version described in the libretto…?” Peter Boal, artistic director of the Pacific Northwest Ballet, is doing just that, for a production that his company will present in Seattle in June this year, and he has had the good sense to invite Marian Smith as a historical adviser, together with Doug Fullington, the company’s director of education. Fulllingon reads Stepanov Notation, in which many works from the late 19th century repertory in Russia are recorded, including Marius Petipa’s last staging of “Giselle,” at the turn of the century. It is Petipa’s version (which presumably retained some choreography from 1841 with which he would have been familiar) that is the basis of most productions we see today, as staged for various companies, from the Diaghilev Ballets Russes into the 1930s, by Nicholas Sergeyev, Petipa’s régisseur, who brought the Stepanov notations with him when he left Russia. These are now in the Harvard Library. American Ballet Theatre’s opening night gala this year on May 17th is apparently intended to be just that, a gala for opening night of its annual spring season at the Metropolitan Opera. Celebration of the company’s 70th anniversary took place on a couple of evenings in the Works & Process series at the Guggenheim Museum. A panel moderated by Rachel Moore, the company’s Executive Director, with Donald Saddler, who danced in the company’s first performance on January 11, 1940; Lupe Serrano and Susan Jaffe, former principals; and Susan Jones, former dancer and present ballet mistress, discussed various aspects of the company’s history. Present members of the company danced excerpts from this season’s repertory, some of which were also relevant to points made in the discussion. It has taken a while for the work of Frederick Ashton to gain a foothold at the Ballet of the Paris Opéra. When Rudolf Nureyev first took over the company, in the early 80s, he wanted to present “La Fille mal gardée.” There was a contretemps of some kind, and Ashton withdrew permission. Instead, the company took on the version recently staged in Geneva by Heinz Spoerli. When “Rhapsody” entered the repertory briefly, in 1996, it didn’t make much of an impression. Then, in 2004, someone had the bright idea of putting on an “Entente Cordiale” gala, with members of the Paris company partnering dancers from the Royal Ballet—Laurent Hilaire with Darcey Bussell in Ashton’s “Awakening” pas de deux from “The Sleeping Beauty,” Manuel Legris with Leanne Benjamin in the “Thaïs” pas de deux, among others. 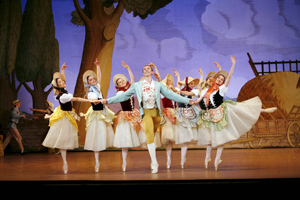 The Royal Ballet itself had a big success with “A Month in the Country” the last time it appeared in Paris.